Astronomers using the National Science Foundation's Very Long Baseline Array (VLBA) have measured the motion across the sky of a galaxy nearly 2.4 million light-years from Earth. While scientists have been measuring the motion of galaxies directly toward or away from Earth for decades, this is the first time that the transverse motion (called proper motion by astronomers) has been measured for a galaxy that is not a satellite of our own Milky Way Galaxy. An international scientific team analyzed VLBA observations made over two and a half years to detect minuscule shifts in the sky position of the spiral galaxy M33. Combined with previous measurements of the galaxy's motion toward Earth, the new data allowed the astronomers to calculate M33's movement in three dimensions for the first time. "A snail crawling on Mars would appear to be moving across the surface more than 100 times faster than the motion we measured for this galaxy," said Mark Reid, of the Harvard-Smithsonian Center for Astrophysics in Cambridge, MA. M33 is a satellite of the larger galaxy M31, the well-known Andromeda Galaxy that is the most distant object visible to the naked eye. Both are part of the Local Group of galaxies that includes the Milky Way. In addition to measuring the motion of M33 as a whole, the astronomers also were able to make a direct measurement of the spiral galaxy's rotation. Both measurements were made by observing the changes in position of giant clouds of molecules inside the galaxy. The water vapor in these clouds acts as a natural maser, strengthening, or amplifying, radio emission the same way that lasers amplify light emission. The natural masers acted as bright radio beacons whose movement could be tracked by the ultra-sharp radio "vision" of the VLBA. Reid and his colleagues plan to continue measuring M33's motion and also to make similar measurements of M31's motion. This will allow them to answer important questions about the composition, history and fates of the two galaxies as well as of the Milky Way. "We want to determine the orbits of M31 and M33. That will help us learn about their history, specifically, how close have they come in the past?" Reid explained. "If they have passed very closely, then maybe M33's small size is a result of having material pulled off it by M31 during the close encounter," he added. 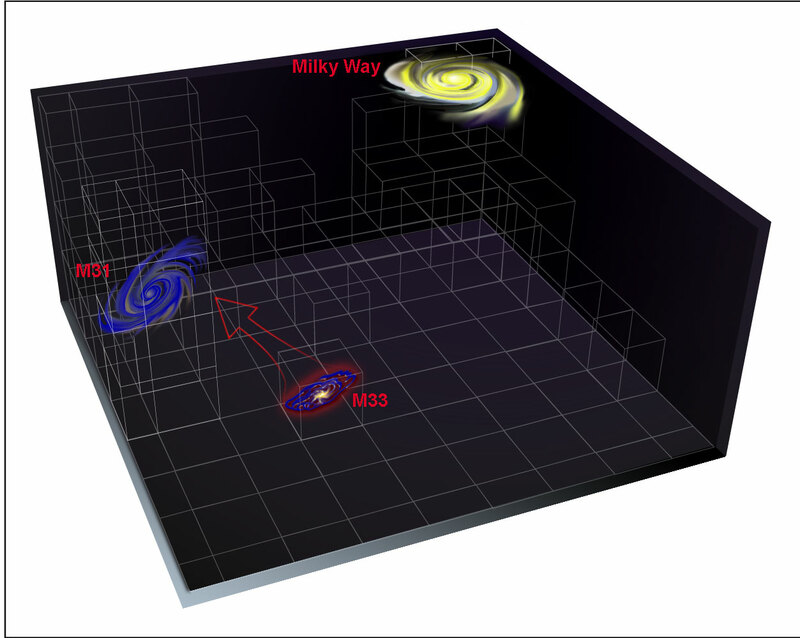 Accurate knowledge of the motions of both galaxies also will help determine if there's a collision in their future. In addition, orbital analysis can give astronomers valuable clues about the amount and distribution of dark matter in the galaxies. 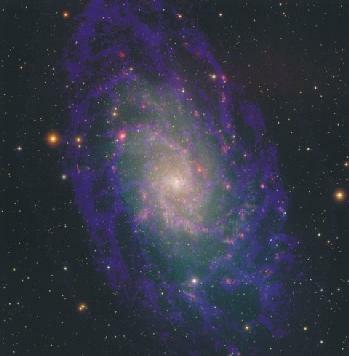 The direct measurement of M33's transverse angular spin is the first time such a measurement has been done accurately. In the 1920s, some astronomers thought they had measured the spin of spiral galaxies, but their results proved to be in error. More recently, radio astronomers have measured the Doppler shift of hydrogen gas in galaxies to determine the spin speed, which, when combined with the angular spin, gives a direct estimate of the distance of the galaxy. The astronomers' task was not simple. Not only did they have to detect an impressively tiny amount of motion across the sky, but they also had to separate the actual motion of M33 from the apparent motion caused by our Solar System's motion around the center of the Milky Way. The motion of the Solar System and the Earth around the Galactic center, some 26,000 light-years away, has been accurately measured using the VLBA over the last decade. "The VLBA is the only telescope system in the world that could do this work," Reid said. "Its extraordinary ability to resolve fine detail is unmatched and was the absolute prerequisite to making these measurements." Reid worked with Andreas Brunthaler of the Max Planck Institute for Radioastronomy in Bonn, Germany; Heino Falcke of ASTRON in the Netherlands; Lincoln Greenhill, also of the Harvard- Smithsonian Center for Astrophysics; and Christian Henkel, also of the Max Planck Institute in Bonn. The scientists reported their findings in the March 4 issue of the journal Science. The VLBA is a system of ten radio-telescope antennas, each with a dish 25 meters (82 feet) in diameter and weighing 240 tons. From Mauna Kea on the Big Island of Hawaii to St. Croix in the U.S. Virgin Islands, the VLBA spans more than 5,000 miles, providing astronomers with the sharpest vision of any telescope on Earth or in orbit. Dedicated in 1993, the VLBA has an ability to see fine detail equivalent to being able to stand in New York and read a newspaper in Los Angeles. The VLBA's scientific achievements include making the most accurate distance measurement ever made of an object beyond the Milky Way Galaxy; the first mapping of the magnetic field of a star other than the Sun; movies of motions in powerful cosmic jets and of distant supernova explosions; the first measurement of the propagation speed of gravity; and long-term measurements that have improved the reference frame used to map the Universe and detect tectonic motions of Earth's continents.